You have to find open award space to book an Etihad Apartment first class experience using reward points. Image by Etihad Airways. Flying in a premium cabin on Etihad, especially the coveted Apartment, is one of the most aspirational frequent flyer awards offered by any airline, but securing these tickets can be daunting if you do not know where to begin. Once you’ve built up points and miles with either a credit card program or frequent flyer program, you’ve got to figure out which specific seats on which specific flights are eligible for mileage redemption. The best way to search for Etihad award availability online is at Etihad Guest Miles. You can search online without creating a login, but you will be pestered mercilessly to create an account. I recommend succumbing early and creating a free login so you can search in peace. Even if you plan to transit through Etihad’s main hub in Abu Dhabi, search for each of your segments one by one. For instance, if you plan to travel from Sydney to Amman, search first for Sydney to Abu Dhabi and then Abu Dhabi to Amman. Typically, the long-haul flight is going to be the most challenging to find. Look for ‘Guest Seats’ in the class of service you want. These seats can be booked – at a significantly better value – with American Airlines (SPG transfer partner) or ANA (Amex Membership Reward transfer partner). Hoping to fly in the Apartment? Make sure you find ‘Guest First’ availability on one of the routes operated by the A380 listed below. Don’t despair if you don’t find availability on the route and dates you want. Guest Miles is notorious for hiding award availability for routes that don’t originate in Abu Dhabi. 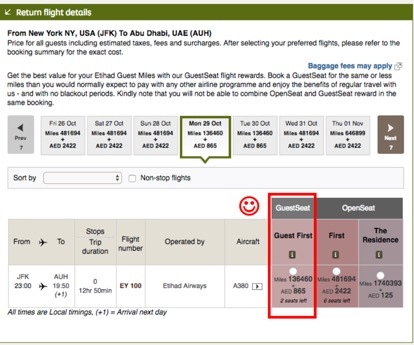 Sometimes it is possible to trick Guest Miles into displaying these hidden award seats by searching for round-trip flights that originate in Abu Dhabi. Let’s say I wanted to get from New York to Abu Dhabi on October 29. An initial search turns up zero Guest First availability. Sad! Before resigning myself to lowly business class, I tried searching for Abu Dhabi to New York with a random departure date and returning on October 29, the date I actually want to travel. And like magic – a Guest First seat shows up for the exact date and flight I wanted! Once you’ve found a seat to book, learn more about how you can redeem!